Built with the strength to handle the toughest environments and crafted with the care to offer all day comfort, the Breach 2.0 9" Side Zip Boots from Smith & Wesson are perfect for tactical professionals, outdoor enthusiasts, industrial tradesmen and anyone who needs a little something extra on their feet. Slip-resistant, rubber outsoles offer a sturdy base that ensures users stay on their feet regardless of environmental conditions. The EVA midsole cradles the sole of the foot, offering increased support and injury prevention. The steel shank increases the boot's torsional rigidity to reduce foot fatigue that occurs after spending a long day your feet. 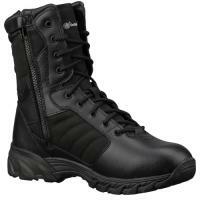 A foam padded collar and leather upper deliver additional comfort, while the gusseted tongue keeps dirt and debris out. These are the most comfortable boots I've owned. Very comfortable I wear everyday. I'm always on my feet so it's nice to have boots that keep up with everything I do everyday. Best bang for the buck and weigh absolutely nothing. Excellent boot for the price. Easy breaking and very comfortable.